Young people preparing to start their own businesses will get assistance from the Seoul Metropolitan Government in the form of housing. A groundbreaking ceremony for the new project was held Thursday afternoon in Daechi-dong, Gangnam-gu, Seoul. Daechi-dong is a district where major companies that provide assistance to startups are concentrated, such as Google Campus, D-camp and Tips Town S1. 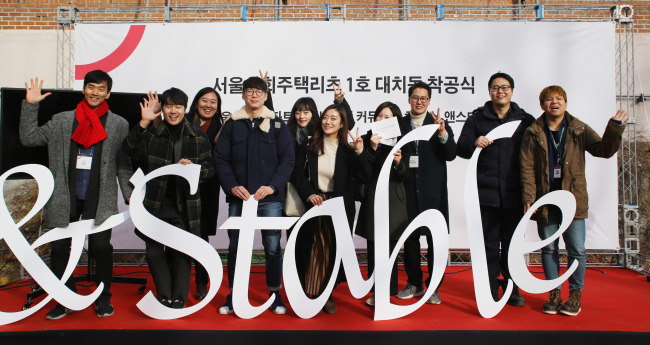 The entrepreneurs will be able to occupy the rental units for up to 10 years and pay only 400,000 won in monthly rent, far less than their market value. “It will be an attractive residential space for young entrepreneurs as it eases living costs, as well as helping them form a community with people in related fields,” the city said. Seoul Social Housing REITs is a 5 billion won ($4.5 million) real-estate investment trust formed jointly by Seoul City and the Seoul Housing & Communities Corporation. Similar rental space is planned next year for other areas of the capital, including Seongsan-dong, Seun Arcade and Sillim-dong, according to Seoul City and SH Corporation.